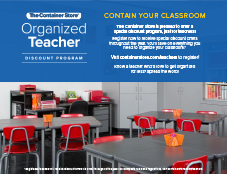 Our Organized Teacher program offers educators special discounts throughout the year to help organize their classrooms! Please complete the form below to receive your first offer, redeemable in-store, online or by phone. Program ends December 31, 2019. I would like to enroll in the POP! loyalty program to get emailed surprise Perks, exclusive invitations, a birthday gift and more! I agree to the POP! terms and conditions. You will be asked to present your School ID for in-store purchases. If your ID doesn't have a number, leave this field blank. If you do not have a School ID, you must present a teaching certificate or other proof that you are a current teacher to use this discount. What are your greatest challenges in keeping your classroom organized? Give us their email addresses and we'll invite them to sign up. Download and print an informational poster for your teachers' lounge. I agree with the Rules & Regulations for this offer. Open to current educators in the U.S. only. Registered teachers will receive discount offers via email throughout the year that feature a unique barcode that may only be used one time, either in-store, online or by phone. Each offer will have its own unique expiration date. For in-store purchases, present the printed email offer, in addition to your Teacher ID and driver's license, at checkout. If you do not have a Teacher ID, you must present a teaching certificate or other proof that you are a current teacher to use the offer. Other forms of identification to verify current teacher employment may include a paycheck stub, teaching certificate or proof of membership in a teaching organization. For online orders, enter the unique, one-time use barcode found on your email offer, in the promotion code field at checkout. For phone orders, please provide the representative with the unique, one-time use number beneath the barcode on your emailed offer. Offer is not valid on Laren, delivery, installation, shipping fees or previously purchased items. Cannot be used towards the purchase of gift cards, redeemed for cash, or combined with any other discount/sale price.